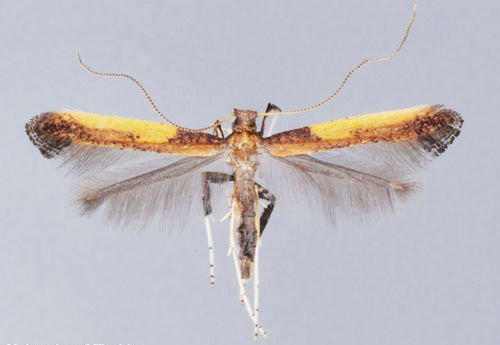 The azalea leafminer, Caloptilia azaleella (Brants), is a larva of a tiny purple- and yellow-marked moth. It is found almost wherever azaleas are grown. Leaf injury by the larva is very characteristic. The folding over of the leaf tip or leaf margin occurs after the larva emerges from within the leaf. In Florida, the larvae are found in every month of the year. However, infestations are most noticeable in nurseries from early spring through August. Figure 1. Mature larva of the azalea leafminer, Caloptilia azaleella (Brants). Photograph by Russell F. Mizell, University of Florida. 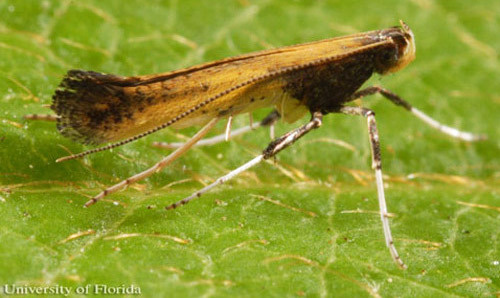 This insect is a destructive pest of azaleas throughout the range of its host. Endemic to Japan, it has been introduced worldwide. In the United States, this species is found from Florida to Texas and north to Long Island, New York, West Virginia and the Ohio Valley. It also is found in northern California and the U.S. Pacific Northwest (Johnson and Lyon 1994, Heppner 2003). 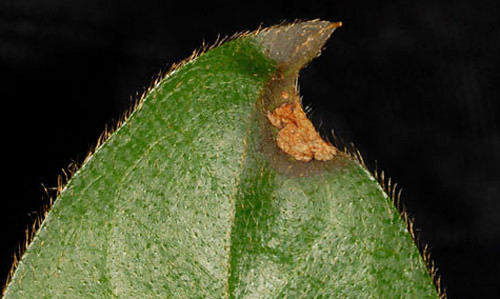 The adult azalea leafminer deposits eggs on the underside of the leaf along the midrib. 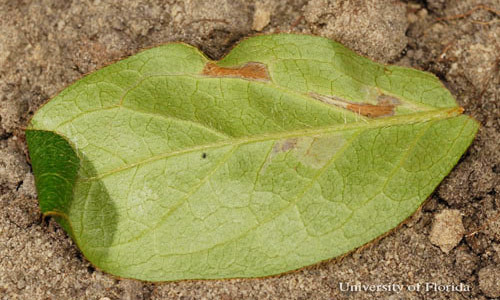 When mature, the larva often selects an undamaged leaf, rolls up in it and pupates. The adult moth emerges in about a week, mates and begins the cycle again (Johnson and Lyon 1994). Figure 2. 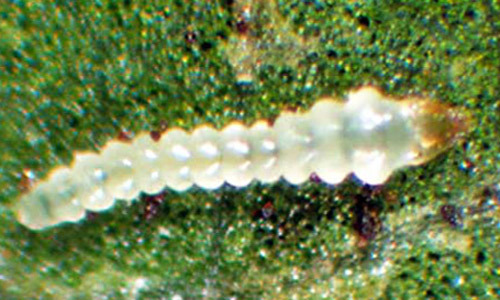 Egg of the azalea leafminer, Caloptilia azaleella (Brants). Photograph by Russell F. Mizell, University of Florida. Figure 3. Pupa (pupal case removed) of the azalea leafminer, Caloptilia azaleella (Brants). Photograph by Russell F. Mizell, University of Florida. Figure 4. 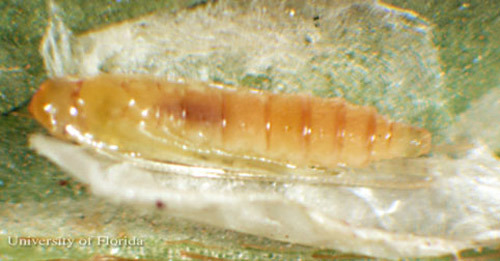 Typical cocoon of the azalea leafminer, Caloptilia azaleella (Brants). Photograph by Lyle J. Buss, University of Florida. 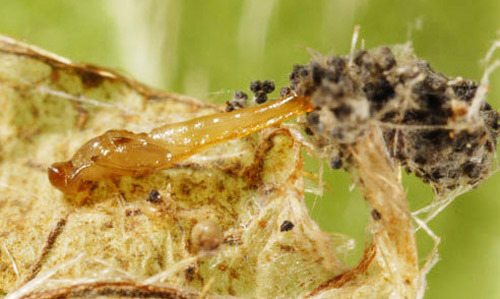 The azalea leafminer is a leafminer only for the first half of its larval life. 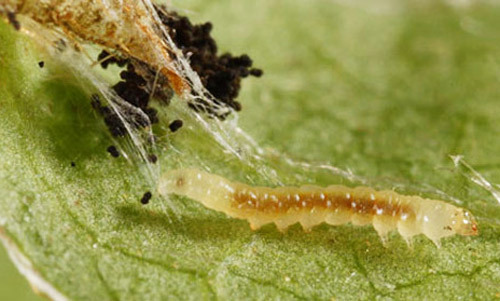 Upon hatching, the young larva enters the leaf directly beneath its eggshell and feeds as a leafminer, creating a blister on the underside of the leaf. The mined area turns brown (Johnson and Lyon 1994). Figure 5. Young larva (upper middle) of the azalea leafminer, Caloptilia azaleella (Brants). Note brown color of mined area. Photograph by Lyle J. Buss, University of Florida. 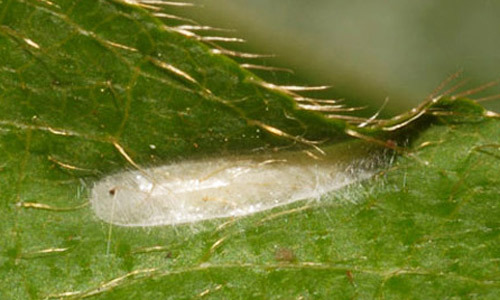 Once it has reached mid-sized, the larva migrates to the upper leaf surface and by means of silk pulls the leaf over its body and chew holes in the leaf. The larva may also tie newly expanding leaves together at the tip of a shoot and feed in the same manner. At this point, the larva is then known as a leaftier. Injured leaves usually turn yellow and drop (Johnson and Lyon 1994). Figure 6. Mid-sized larva (4.5 mm long) of the azalea leafminer, Caloptilia azaleella (Brants). Note dark frass (insect waste) at upper left of image. Head of larva is at right. Photograph by Lyle J. Buss, University of Florida. The larval stage that folds the leaf is about 0.5 inch long, yellowish, and with three pairs of abdominal prolegs which are found on abdominal segments 3, 4, and 5. The proleg hooks (crochets) are singly arranged in a U-shaped pattern (penellipse), with a series of crochets within the penellipse. Figure 7. Larva with abdominal segments bearing prolegs indicated by number. Graphic by Division of Plant Industry. Figure 8. Ventral view of left proleg, fourth abdominal segment, showing arrangement of crochets. Graphic by Division of Plant Industry. The adult is a small, yellow or golden-colored moth with purplish markings on the wings. The wingspread is about 10 to 13 mm. Most of its life is spent hidden among the leaves of the host. Figure 9. Adult azalea leafminer, Caloptilia azaleella (Brants). Photograph by Lyle J. Buss, University of Florida. Figure 10. Adult azalea leafminer, Caloptilia azaleella (Brants). Wingspan of this specimen is 9.9 mm. Photograph by Lyle J. Buss, University of Florida. Figure 11. 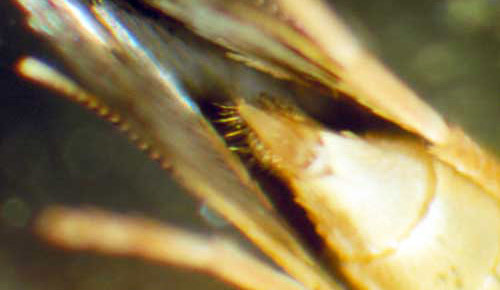 Ovipositor of adult female azalea leafminer, Caloptilia azaleella (Brants). Photograph by Russell F. Mizell, University of Florida. In Florida, there is continuous breeding. Georgia has reported three to four generations a year, while even as far north as Long Island there are two generations per year. In Oregon, there are three generations per year and the insect overwinters as a last-instar larva or pupa in a rolled leaf, or occasionally as a tiny miner in a leaf (Johnson and Lyon 1994). Azaleas (Rhodendron spp.) are the only hosts recorded for this insect. This leaf miner is a pest of container and field-grown azalea nursery stock. However, plants in the landscape are also commonly attacked. Injured leaves usually turn yellow and drop, thus causing an unsightly plant. If the insect is controlled early, the plants will outgrow the injury it causes (Johnson and Lyon 1994). Figure 12. 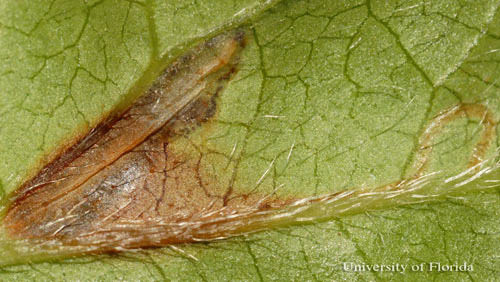 Under leaf surface of azalea foliage damaged by azalea leafminer, Caloptilia azaleella (Brants); leaf folds (tip of leaf) and two mines (brown areas). Photograph by Lyle J. Buss, University of Florida. Figure 13. 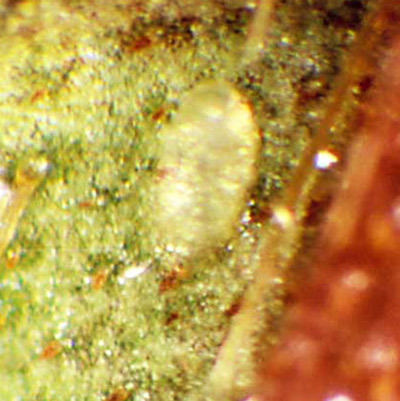 Upper leaf surface of azalea foliage damaged by azalea leafminer, Caloptilia azaleella (Brants); leaf die-back (at tip) and two mines (near tip). Photograph by Lyle J. Buss, University of Florida. Cultural control. Prune off and destroy infested branches. Keep plants healthy (properly irrigated and fertilized) so they can tolerate and outgrow the damage (Buss 2006). Biological control. 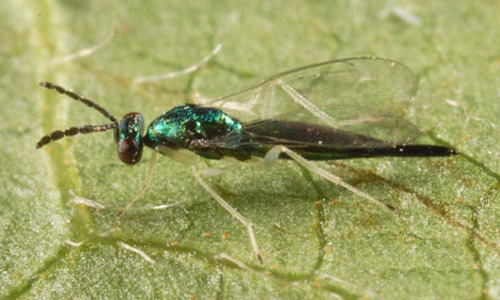 There are at least three different species of parasitoids, of the azalea leafminer, in the genus Sympiesis Förster (Hymenoptera: Eulophidae). 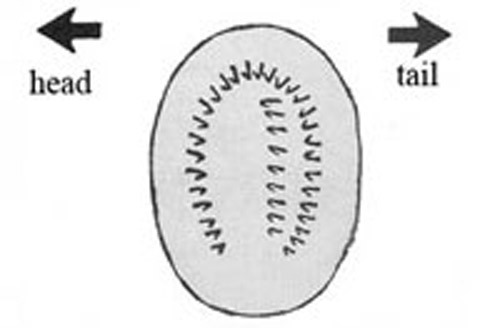 They are the major species attacking the pupa (Mizell and Schiffhaur 1991). Figure 14. 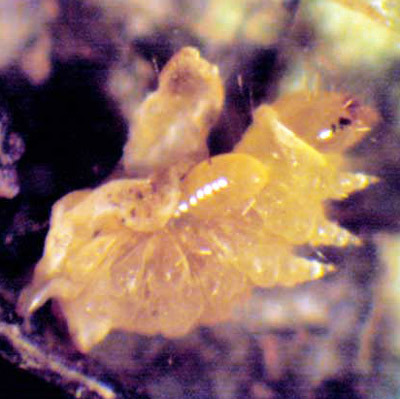 Larva of a Sympiesis sp. 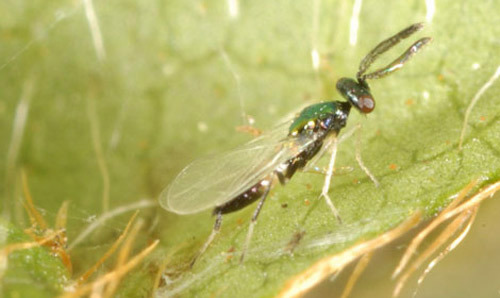 parasitoid feeding on a larva of an azalea leafminer, Caloptilia azaleella (Brants). Photograph by Russell F. Mizell, University of Florida. Figure 15. Adult female Sympiesis sp. parasitoid of the azalea leafminer, Caloptilia azaleella (Brants). Photograph by Lyle J. Buss, University of Florida. Figure 16. Adult male Sympiesis sp. parasitoid of the azalea leafminer, Caloptilia azaleella (Brants). Photograph by Lyle J. Buss, University of Florida. Figure 17. The cocoon of a Sympiesis sp. parasitoid of the azalea leafminer, Caloptilia azaleella (Brants). Photograph by Lyle J. Buss, University of Florida. Chemical control. Leafminers are difficult to control as they are protected by leaf tissue. The best time to manage them is when larvae first hatch inside the leaves and begin to feed as plant damage is minimal. When many large or long mines are seen, the leafminer may have completed its development, and control is not useful (Buss 2006). The Project Coordinator thanks Dr. Russell F. Mizell, University of Florida, for his review of this updated publication. Kerr TW. 1959. Insects of ornamental trees and shrubs in Rhode Island. Agricultural Experiment Station Bulletin 348: 12-13. Dickey RD. 1965. Azalea culture. Agricultural Experiment Station Circular S-172. University of Florida, Gainesville, Florida. Johnson WT, Lyon HH. 1994. Insects That Feed on Trees and Shrubs. 2nd ed. rev. Cornell University Press, Ithaca, NY. 560 p.
Mizell RF, Schiffhaur DE. 1991. Biology, effects on hosts, and control of azalea leafminer (Lepidoptera: Gracillariidae) on nursery stock. Environmental Entomology 20: 597-602. Originally published as DPI Entomology Circular 55. Updated for this publication. Publication Date: June 2007. Latest revision: April 2010. Reviewed: February 2019.